This post is sponsored by Florida Strawberry. All opinions are my own. 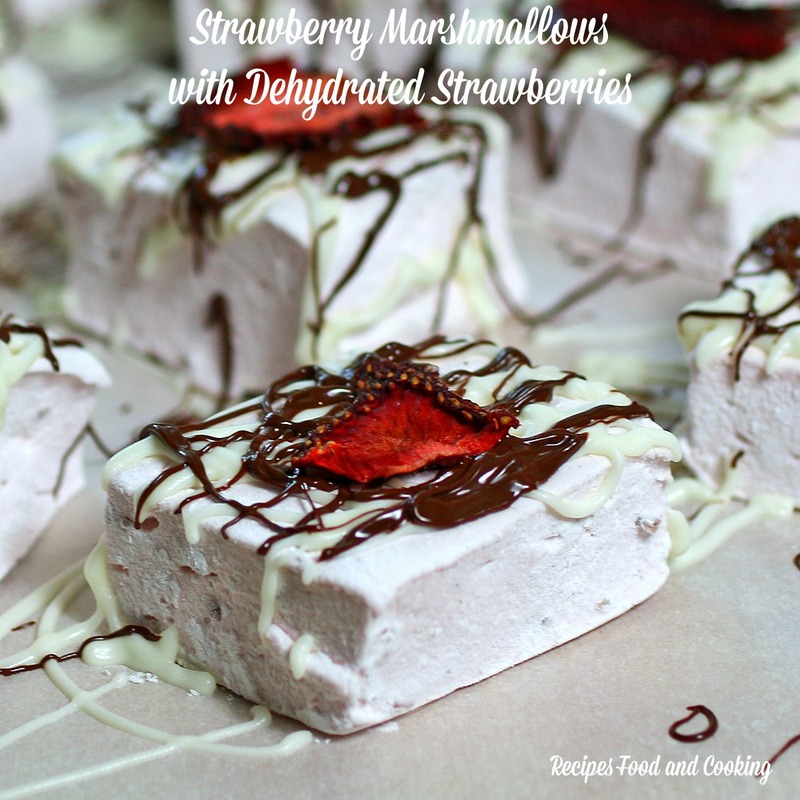 I’m so excited to share this strawberry marshmallow recipe with you using Florida Strawberries that have strawberries in them that have been dehydrated. 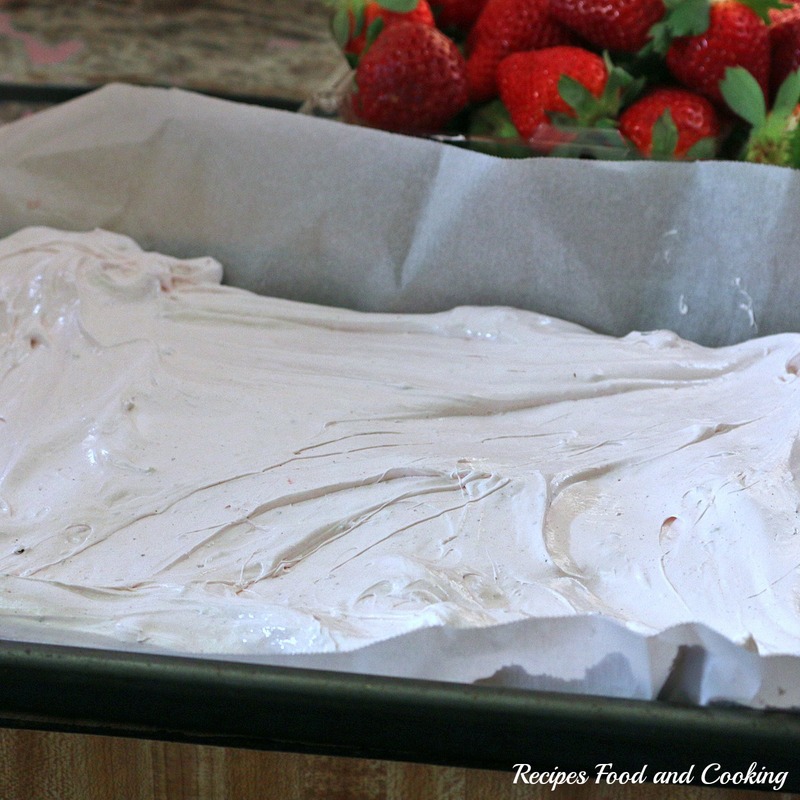 I love Florida strawberries in case you can’t tell from all the recipes I post using them. I am so lucky to live in Florida where we can get them all winter long starting in December thru April. In fact, we made a trip to Goodson’s Farm today to pick up a flat of strawberries. It’s been a little cool here this week and that tends to make the strawberries even sweeter than they usually are. I wasn’t disappointed. I actually just put 3 more trays of strawberries in my dehydrator, I think I’m becoming obsessed. Not really but they sure are good! One of the things I do to extend the season is to dehydrate the strawberries. Anytime I see a sale on them, I get out my dehydrator to preserve them so I can enjoy them year around. 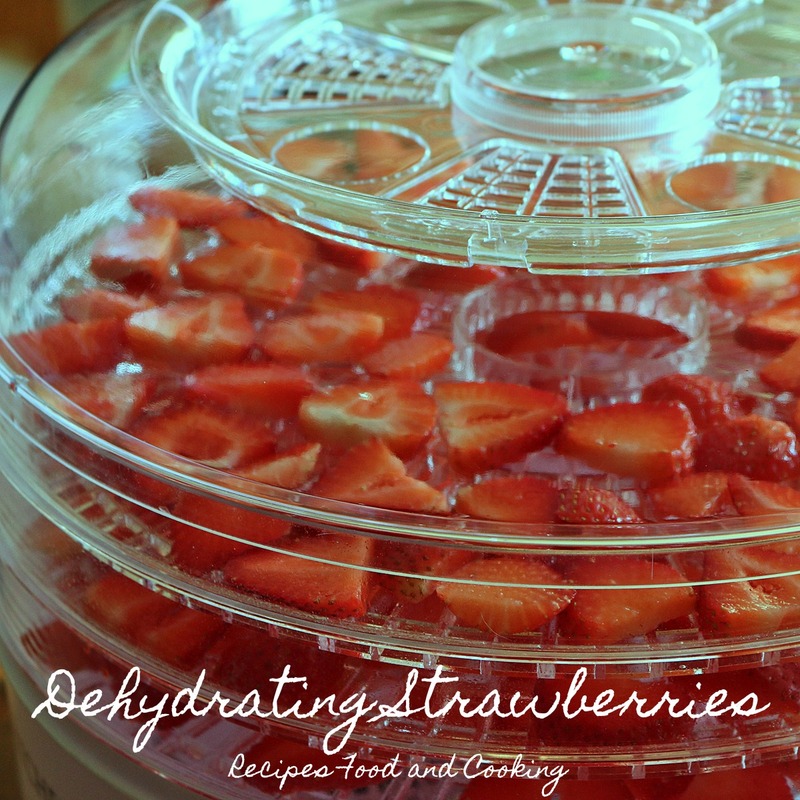 Dehydrating strawberries is so easy too. 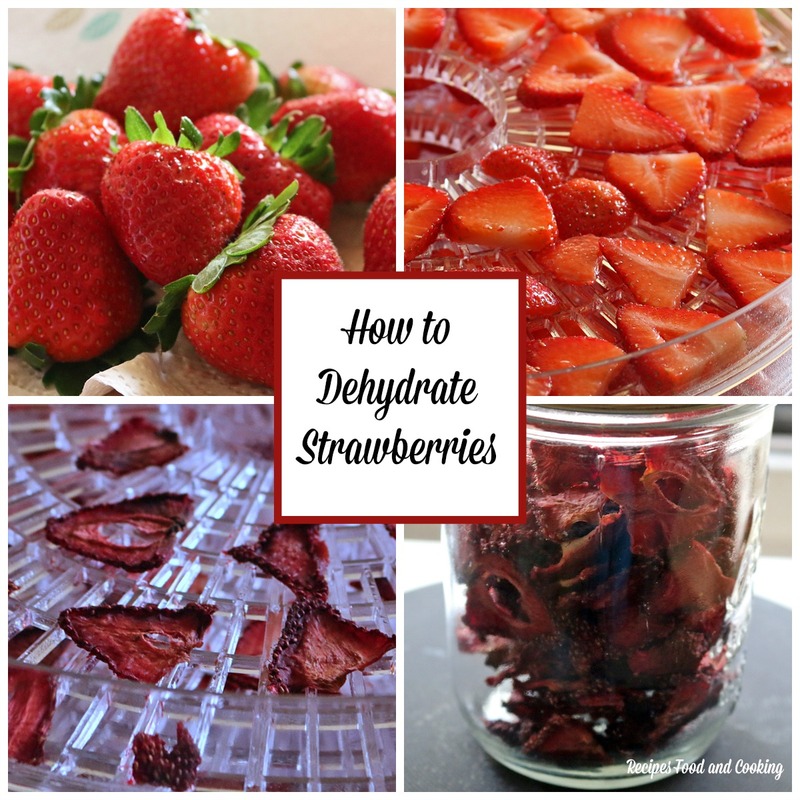 2 quarts of berries will get you about a pint of dehydrated strawberries. 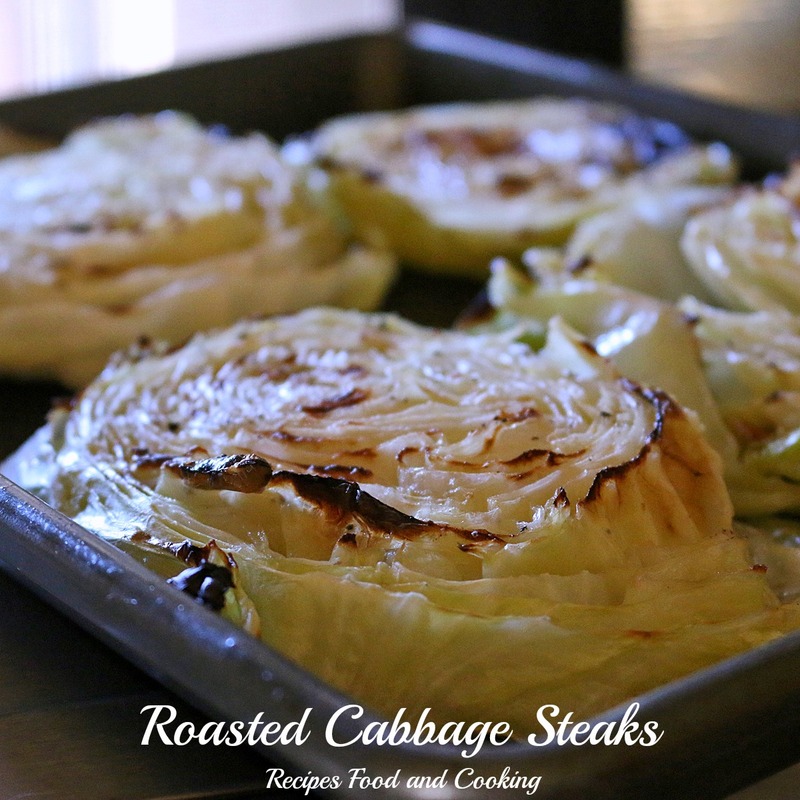 They are perfect for cooking with or eating them right out of the jar for a quick snack. To dehydrate them, I just wash them and dry them with some paper towels. Spray the drying racks very lightly with cooking spray. I wipe it off some with a paper towel after spraying. Next you are going to slice or quarter them and lay them on the drying rack, not touching. I have found I love them best when quartered for snacking but are just as good when sliced. The sliced ones will chop up easier in the food processor so there are benefits to both ways. When you quarter them, you do extend the drying time by about 4 hours. I also place them skin side down, so as to not lose the juices. Then I turn on my dehydrator and let it do its magic. I do rotate the shelves a couple of times if I’m doing a lot of berries at the same time. When the strawberries are dry it is time to condition them so that they don’t mold. I put them in a plastic bag to freeze them to pasteurize them for 24 hours. Then put them in a glass jar until it is about 3/4 full. Then you are going to shake them at least once a day for 3 – 4 days. To store them keep them in a cool, dry place. I’ve written a post with full photos that you can see here for lots more tips and details. If you’ve never made marshmallows before you are in for a treat. They taste so good especially when strawberry flavored like the ones I did here. We’re going camping this weekend and I can’t wait to make strawberry s’mores with these. You’re going to start by softening your gelatin. Sprinkle the gelatin over cool water. Stir in and let set for at least 5 minutes. Next you are going to make the sugar syrup. 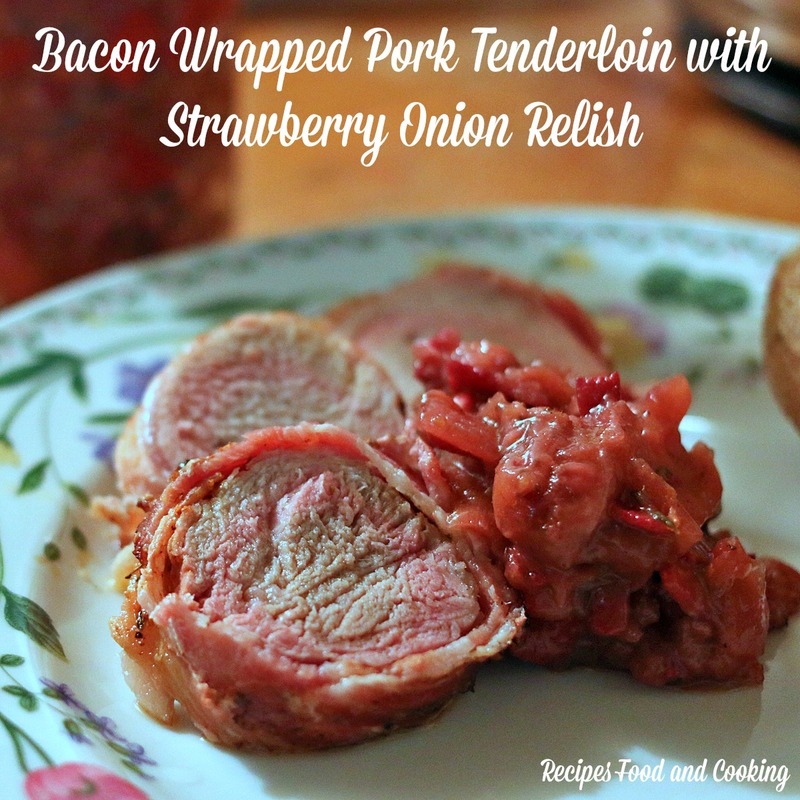 When it gets to 235 degrees I add the dehydrated strawberries and cook until 238 degrees. They break down real fast at this heat. You will see them dissolve almost. I let the mixture sit for about 5 minutes then add the vanilla and strawberry extract. Slowly start pouring the sugar mixture into the gelatin using a wire whip on the mixer. 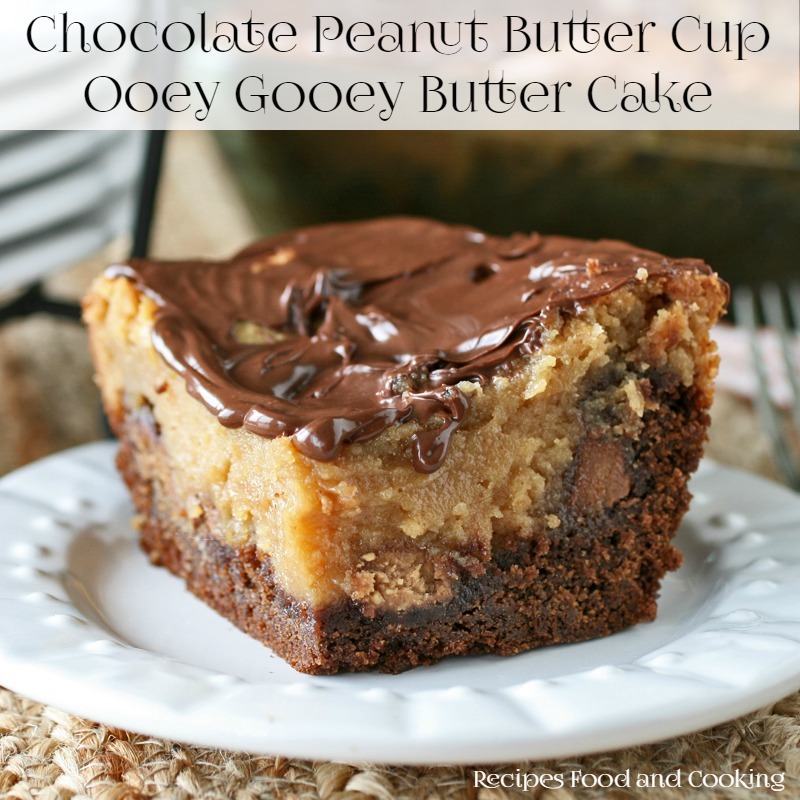 When all the mixture is added in continue to beat until stiff peaks form. It takes about 8 – 12 minutes with a Kitchen Aid mixer. If you want a real pink marshmallow you can add red food coloring at this point. I decided not to but if you do I would add about 5 drops and mix it in. Then decide if you want more color and add accordingly. You then quickly spread the marshmallow mixture out into a prepared pan that is lined with parchment paper. Spray very lightly with cooking spray and wipe with a paper towel. I used 2 cookie sheets this time because I wanted a thinner marshmallow than I usually make. Then I cut some out with a cookie cutter to make some Easter suckers in addition to the marshmallow squares I did topped with chocolate and a dehydrated strawberry. Homemade Marshmallows are light and billowy, so unlike the kind you buy in a bag. 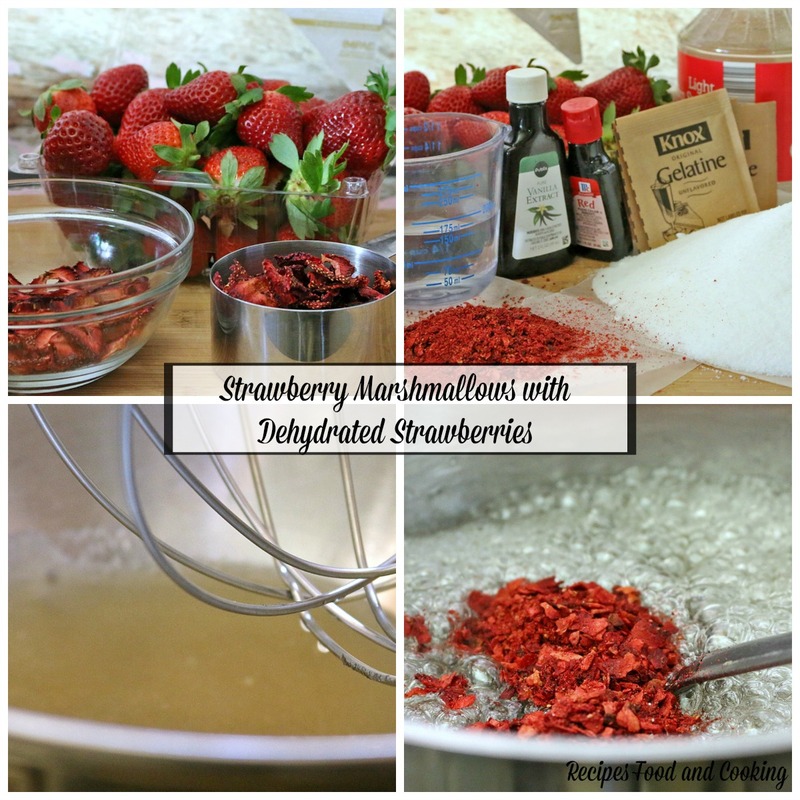 With these I added dehydrated strawberries, then topped with white and dark chocolate and a dehydrated strawberry. Put granulated sugar, corn syrup, salt, and ¾ cup water into a medium saucepan. Bring to a boil over high heat, stirring to dissolve sugar. Cook, without stirring, until mixture registers 238 degrees on a candy thermometer, about 9 minutes. Meanwhile, put ¾ cup cold water into the bowl of an electric mixer; sprinkle with gelatin. Let soften 5 minutes. Attach bowl with gelatin to mixer fitted with the whisk attachment. With mixer on low speed, beat hot syrup into gelatin mixture. Beat in vanilla. Gradually raise speed to high; beat until mixture is very stiff, about 8 - 12 minutes. Pour into prepared dish, and smooth with an offset spatula. Set aside, uncovered, until firm, about 3 hours. Sift 1 cup confectioners' sugar onto a work surface. Unmold marshmallow onto confectioners' sugar; remove parchment. Lightly brush a sharp knife with oil, then cut marshmallow into 2-inch squares. Sift remaining ½ cup confectioners' sugar into a small bowl and roll each marshmallow in the sugar to coat. Marshmallows can be stored in an airtight container up to 3 days. To decorate, I poured my mixture into 2 cookie sheets, so the marshmallows would be about an inch thick. When ready I cut into squares. I melted 4 oz. of both white and dark chocolate at 50% power for 30 seconds and stirred. Then did it in 15 second intervals until melted. Drizzle with a fork over the top of the marshmallows. Top with a dehydrated strawberry. I cut the second tray with a cookie cutter that was lightly sprayed with cooking spray. I dipped the cutouts into white chocolate and added chocolate sprinkles. 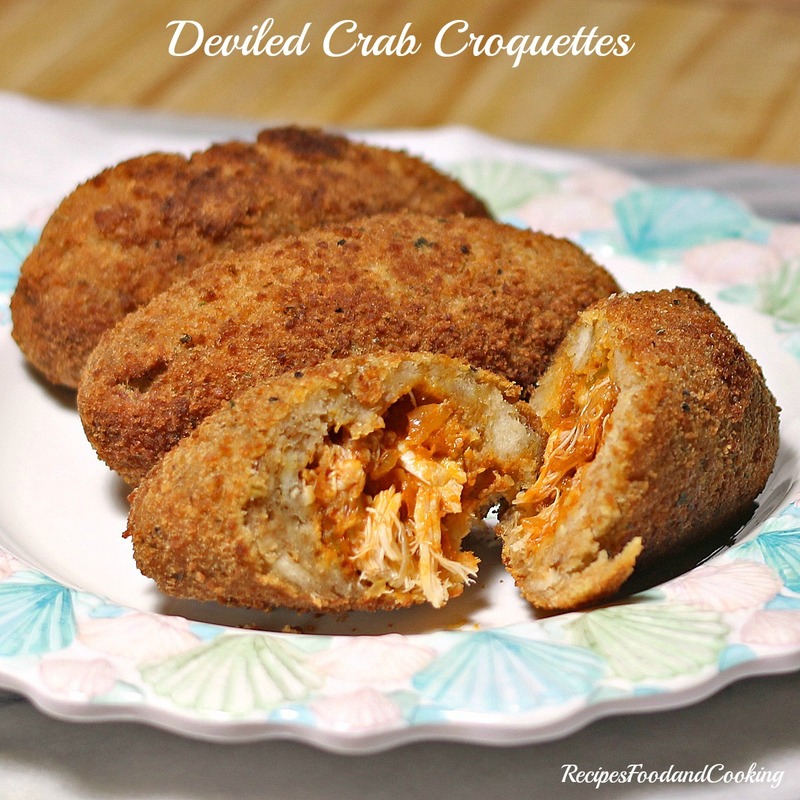 They also have a cookbook available at the website that I love! 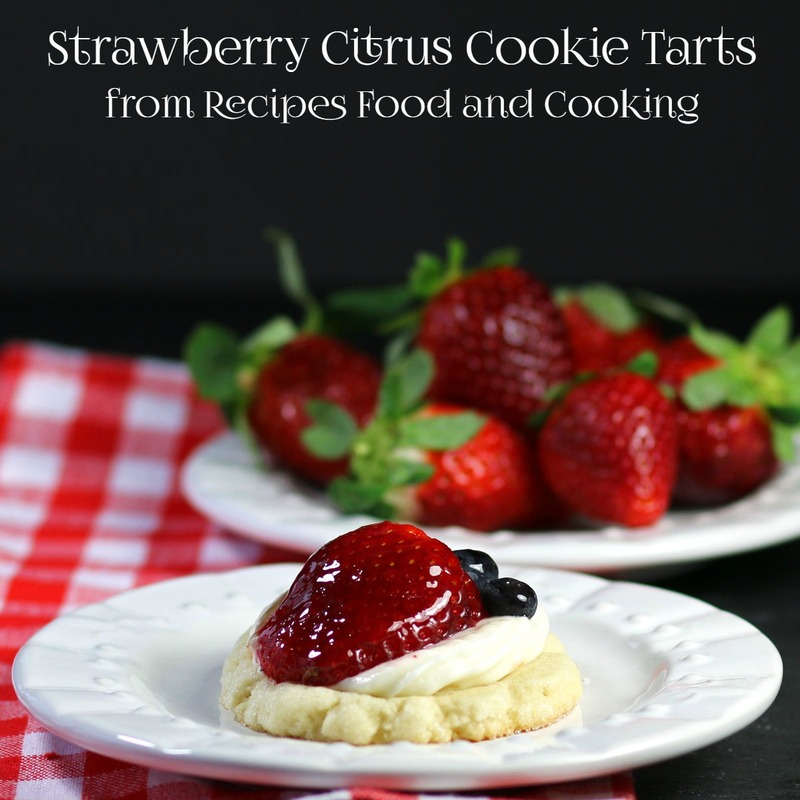 Florida Strawberries Cookbook – A Taste of Summer All Winter Long. 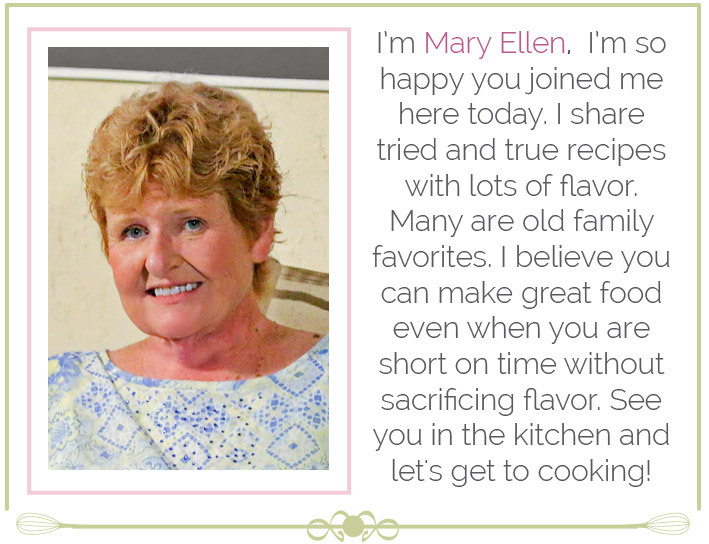 Hi Mary Ellen, I love this recipe. 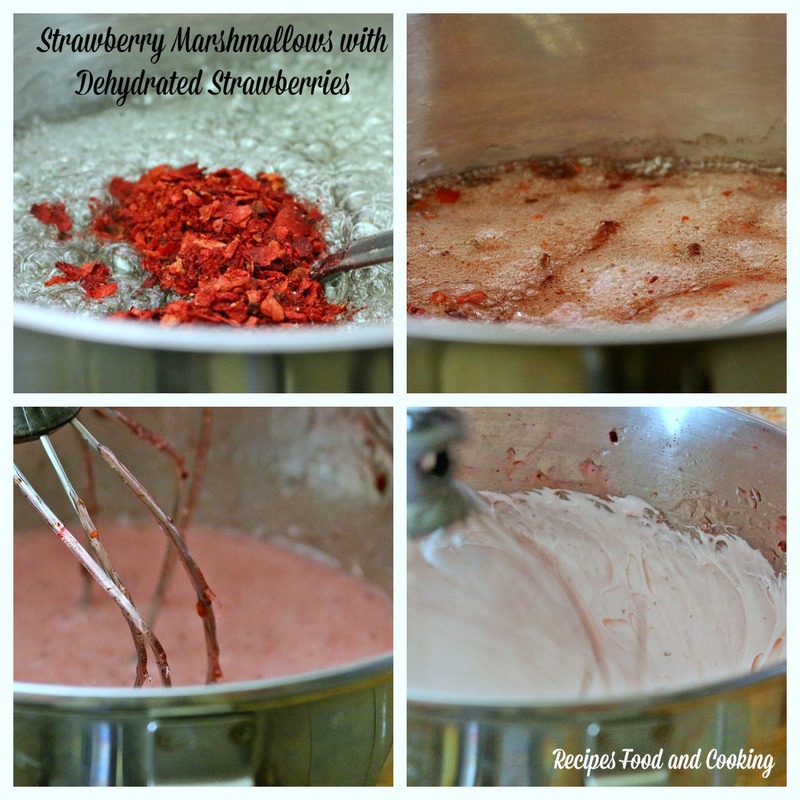 We often make homemade marshmallows but I never thought to add dehydrated fruit. I’ll have to try this next time. I love homemade marshmallows so much! 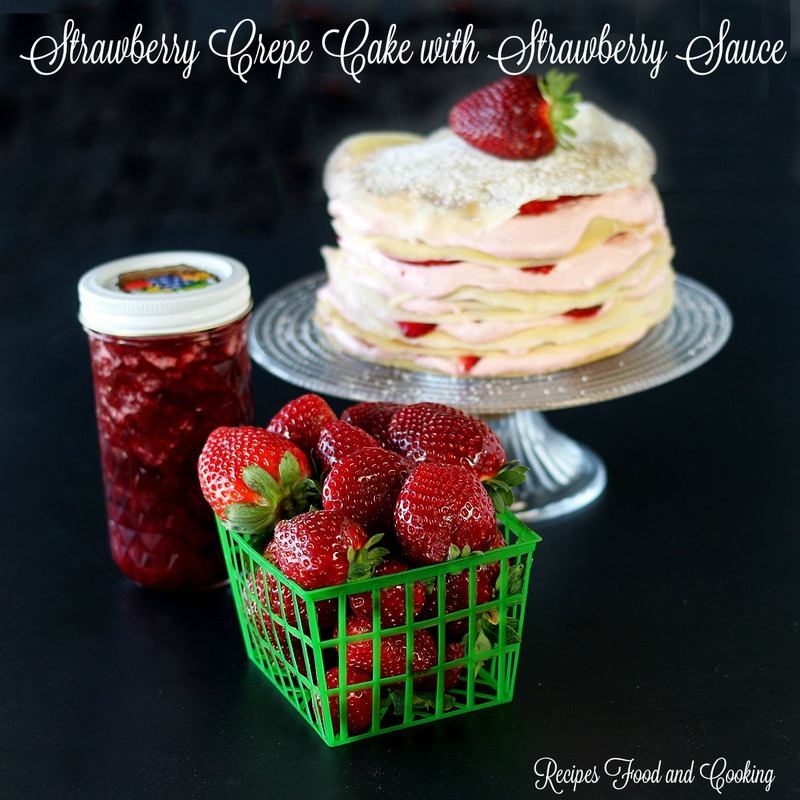 I’ve never made a strawberry one but I can’t wait to try it! Great storage tips for dried strawberries. 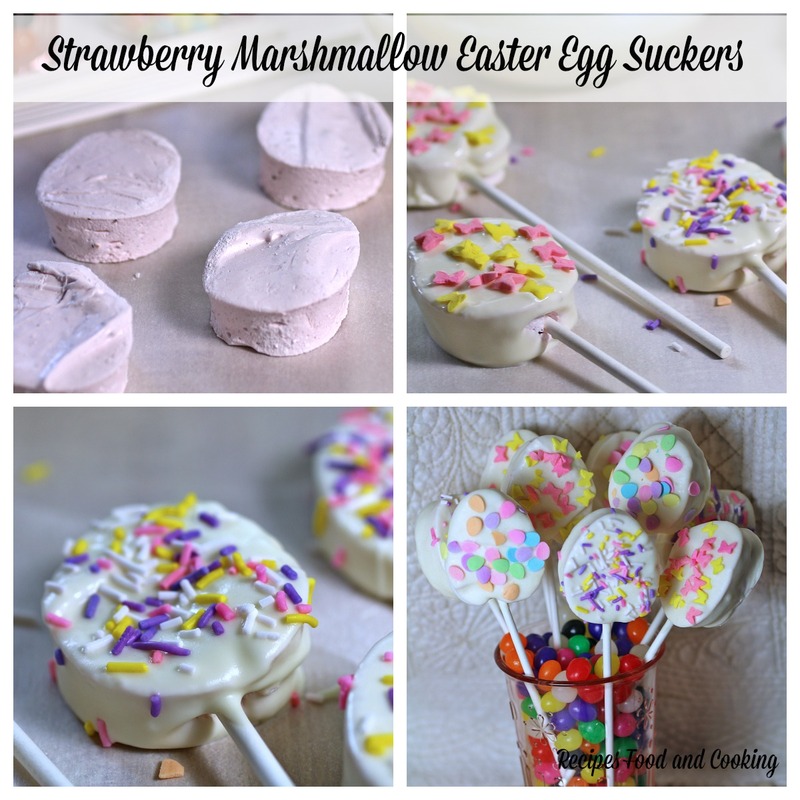 Yours look amazing on these marshmallows! 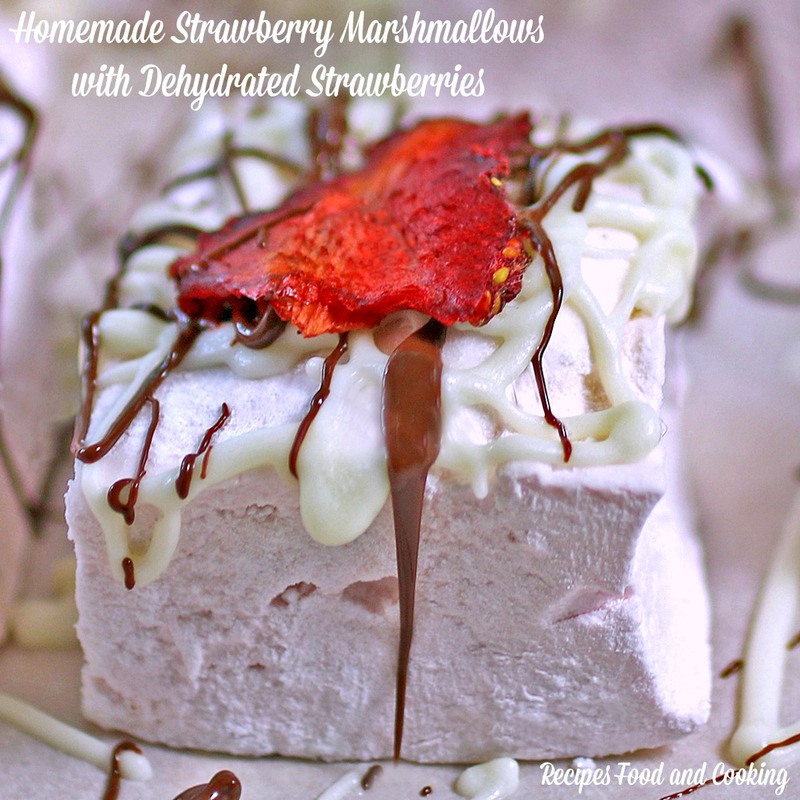 Homemade marshmallows are the best and I bet the strawberry flavor in these is crazy good! 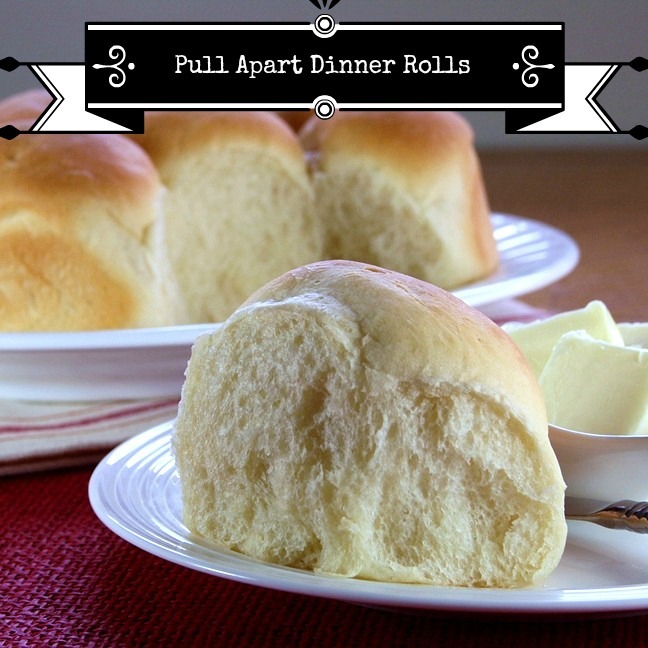 What a fun recipe and unique idea!